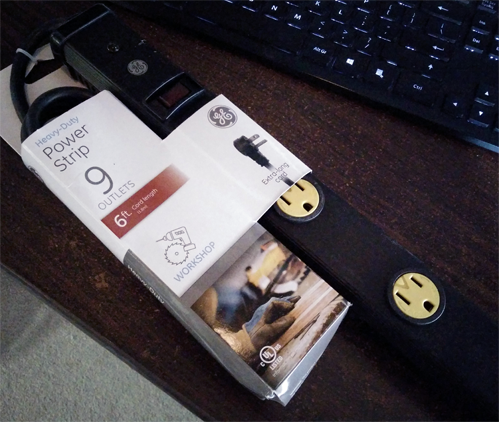 I bought a heavy-duty power strip from Walmart which I would like to mount to the metal support structure of a banquet table. There is a smooth metal surface along the under edge of the table to which adds mechanical support. It is roughly the same height as the power strip is wide and is a perfect place to hide the strip to be used for connecting a number of electronics. This worked OK for a while but the weight of the strip itself caused it to tilt over time until it finally detached from the adhesive. The adhesive held just fine to the table but was weak at bonding with the plastic of the strip. I have no problem punching a hole in the metal frame to mount this but I don't know what tool would be required to perform this task. The metal appears to be 1/4" steel and has a lip on the bottom which would prevent me from using some kind of punch which must clamp flush with a piece of sheet metal. What is the proper way to go about mounting this strip so that it is secure and won't fall off again but will allow removal for later transportation. Note that removal isn't as important but the strip does have a fuse and it would be useful to be able to easily swap it out if it does break at some point in the future. Regardess of the intent of the cross, the metal endcap of the power strip has a hole shaped like a gourd (or like a male chicken and globes, if you have a dirty mind). That is designed to be used with a screw mounting. The screw should be chosen so the head just fits through the larger diameter, but only the shaft fits in the slot. Slide the screw head theough the hole, slide it down into the slot, then tighten the screw tight so it can't move. Now only a firm sideward pull will dislodge it. You can stop that by a cleverly placed additional screw. If your steel is even 1/16", I would consider drilling and tapping the hole for the screw. I'm sure you messed up the fraction because tables like that don't have a solid 1/4" steel apron - it's probably 1/16" or less. My first suggestion would have been the very mounting tape you tried, but it does fail with certain materials. 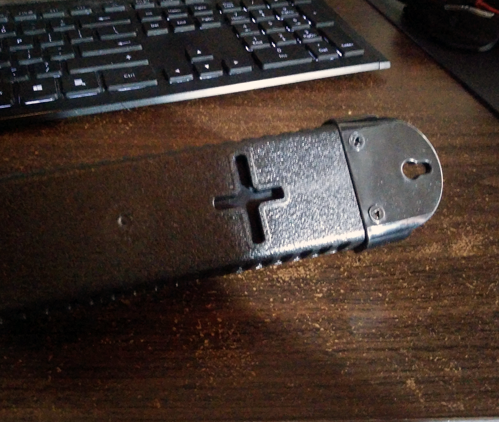 The next step is going to be using a drill to make holes where those mounting crosses are located. drill a small hole and then use nuts and machine screws to fasten the strip. Leave the screws loose enough to slide on the strip, then tighten the nuts the rest of the way. You shouldn't have to tighten them very much, so the head of the screw turning shouldn't be a huge issue. Star washers can help if that does become a problem. Another choice is to purchase one or two C-clamps in a two or three inch size. Use them to clamp the end ears of the plug strip to the table support flange. Easily removed for transport or moving plug strip position on the table. First of all make sure you have cleaned and prepped the back of the strip and the metal surface you are attaching to. Try using a strip of Velcro tape that runs the entire length of the strip, NOT just a couple inches at each end. Offset the tape attached to back of the strip toward what will be the high side. To separate you can run a pointed putty knife or any other plastic or metal shim between the eyes and hook portions of the Velcro strips. There are even stronger versions of the traditional strips that are all plastic where both side look like mushroom heads. Self tapping sheet metal screws available at most any hardware store. Drill one through each cross into the table. Faster, prettier, and longer lasting than tape. The nature of "Self-Tapping" is that the screw itself is a drill bit. These screws equate to always having a sharp brand new metal drill bit. So you may want to wrap the exposed sharp end of the screw for safety reasons. After screwing in the power strip, use Zip Tie Saddle Mounts to hold the wires in place. The Saddle Mount can be screwed into wood or metal. Run a zip tie through the mount to fasten electrical or data cables. Not the answer you're looking for? Browse other questions tagged mounting hole metal-cutting or ask your own question. How to mount hooks into concrete ceiling that must be able to support several times bodyweight? How do I mount this box without drilling or damaging the shelf? How can I mount a security camera on the outside of the house?